Many of us remember the controversy surrounding Elizabeth Warren referring to herself as Native American. A 1997 article from the Fordham Law Review listed the Massachusetts Senator as the “first woman of color” hired by Harvard Law School. 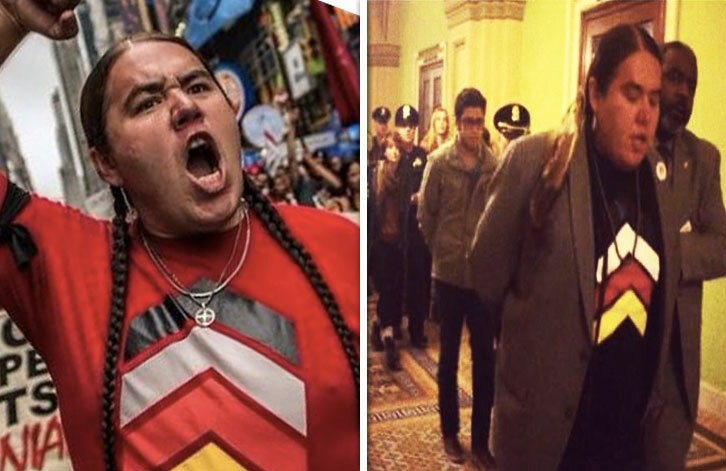 But in spite of her questionable Native heritage, Elizabeth Warren called the Senate police on Greg Grey Cloud who had tried to honor the legislators who voted against polluted water tables within Native and non-Native communities. via Cops Arrest Native American For Singing ‘Honor Song’ After Keystone Pipeline Voted Down. arrested for honor song, gray cloud, greg gray cloud, greg grey cloud, grey cloud, honor song, keystone pipeline, senate, wtf moments. Bookmark. An alpha male is not just a leader. An alpha male is a father or father-er. One doesn't become alpha by shagging the most women or shagging hot women or being the biggest jerk. One becomes alpha by raising children and providing for and protecting them, as well as teaching them to survive, thus earning their respect. No pack, no alpha. This term is horribly misused, I guess because it sounds cool...but truly it means "Beloved father." That's it.